The Chinnaswamy stadium in Bangalore was a witness to an iconic and historic moment in the history of international cricket on Thursday when the Afghanistan national cricket team played their first ever test match. The match was a momentous occasion given the hardships the Afghan side has had to overcome to reach this stage. A country rocked by terrorism and wars, the national side had no pitch, equipment or facilities to play on when they started their unique journey. However after just a few years, the resilience and determination of the Afghan national side pulled through to become only the 12th side in the history of the game to get the status of a test playing nation. They also became the quickest team to reach this status, after all their cricket federation is only 25 years old. Coming back to the India Vs Afghanistan Day 1 match, Afghanistan’s joy and excitement at playing their inaugural test match was soon killed off after the number one test side blew them apart in the first session of the match. 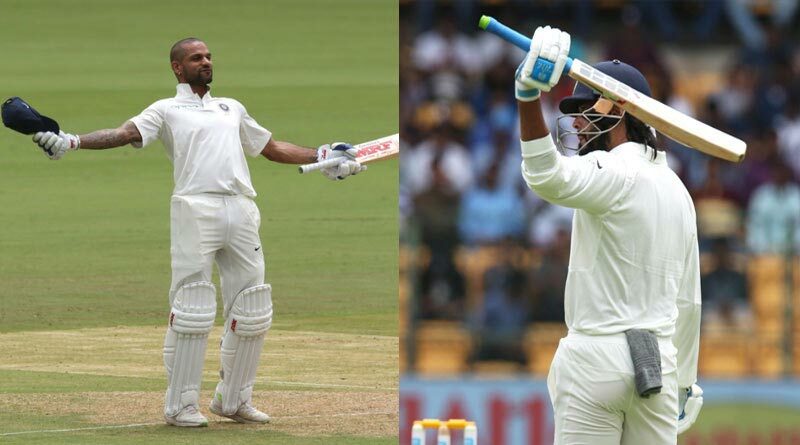 Indian openers Shikhar Dhawan and Murali Vijay stepped out to make a name for themselves before the upcoming tour and boy did they deliver. With Murali Vijay preferring to defend in the early part of his innings, Dhawan took the mantle of being the aggressor. He stepped out and opened his hands every over, hitting a boundary in each of the first 10 overs of the innings to burn down all of Afghanistan’s plans. So perturbed was the Afghanistani skipper Stanikzai that he brought on his famous spinners much earlier than anticipated in a bid to contain the Indian batsmen. On a green pitch that was much more suited to pacers, Rashid Khan and Nabi found it tough to get any purchase on. The move by Stanikzai proved to be more detrimental then beneficial as Dhawan played his fellow Sunrisers Hyderabad team-mate Khan with ease, completely killing off one of the best spinner in the world’s confidence. With the match offering nothing for the newbies, Afghanistan knew they badly needed a change of tactics. And the lunch break brought that about for them. Gathering and regrouping as a unit they bounced back after a small rain delay. Picking up Dhawan(107) to nab their first test wicket, the Afghanistani side continued their pressure. It paid off for them with apart from Vijay(107_, the Indian middle-ordered crumbled to end the day at 378-6. If you think we missed any important moment from the India Vs Afghanistan Day 1 match highlights do comment below. Stay tuned for more India Vs Afghanistan match highlights.